When the offering bucket came around, Pheara dropped in all the money that he had in the world. Apart from Afghanistan’s national flag, the national flag of Cambodia is the only other national flag in the world to incorporate an actual building on it. Khmer, the national language, is spoken by about 95 percent of Cambodians. French is the second language and is often used in business and official circles. Cambodia's economy has been based traditionally on agriculture. About 85 percent of cultivated land is devoted to the production of rice, while rubber trees account for most of the rest. To Sabbath School teachers: This story is for Sabbath, Oct. 27. Pheara decided to test God at the age of 19. 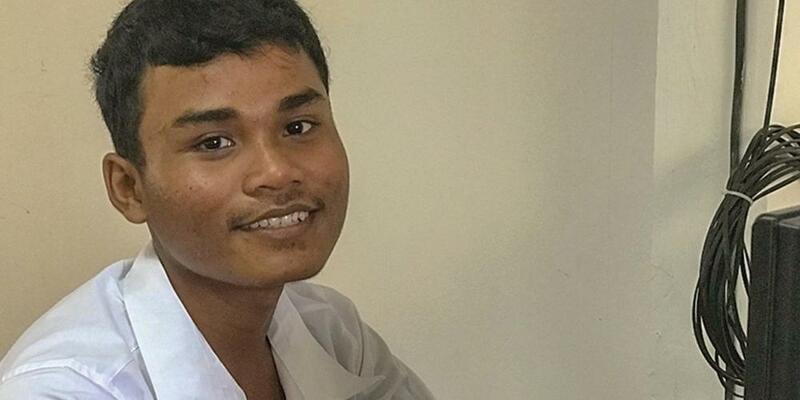 The teenager had been attending the Seventh-day Adventist church for several months in Battambang, Cambodia’s second-largest city. He had heard the pastor read the promise of Malachi 3:10, which says, “‘Bring the whole tithe into the storehouse, that there may be food in my house. Test me in this,’ says the Lord Almighty, ‘and see if I will not throw open the floodgates of heaven and pour out so much blessing that there will not be room enough to store it’” (NIV). So, when the offering bucket came around on Sabbath, he dropped in a 1,000 Cambodian riel banknote (about 25 U.S. cents). It was all the money that he had in the world. The next day, his older brother Phirun inexplicably gave him 10,000 riel ($2.50). His brother sometimes gave him money on special occasions like the Cambodian New Year or a traditional celebration of the dead. But he had never handed Pheara money for no particular reason. But even then he wasn’t ready to believe that it was a gift from God. The next Sabbath, he decided to test God again. When the offering bucket stopped by him, he put in another 1,000 riel. This time, he had 5,000 riel in his pocket, but he needed every bit of it to fill up his motorcycle with gasoline during the next week. After giving the 1,000 riel, he didn’t have enough money for gasoline. A few weeks after that, Pheara got into serious trouble. The church organized a Christmas program, and Pheara invited 15 friends to attend. But he had to ferry them in threes on the back of his motorcycle to the church. As he neared the church on one trip, a police officer pulled him over. None of his passengers were wearing helmets, a requirement under Cambodian law. But the police officer did not talk about helmets. Instead, he asked for the motorcycle ownership papers. Pheara called his brother, who owned the vehicle, and was told that the documents had been lost long ago. Pheara was worried. The police could confiscate the motorcycle and charge him with theft. He didn’t know what to do. Pheara had no money, so he could not be on his way. But he did have an old computer in his backpack that he had unsuccessfully tried to sell for several weeks. He left his motorcycle with the police and walked to a nearby pawnshop. The shopkeeper immediately gave him 40,000 riel for the computer, and Pheara paid the police. The incident strengthened Pheara’s faith. His friends without helmets, who were watching to see how he would deal with the situation, expressed their surprise once they arrived at the church Christmas program. “Your God really helped you with the police,” they said. Pheara borrowed helmets from church members before riding off to fetch the rest of his friends for the Christmas program. Today, Pheara is the only baptized Christian in his family. He also is a university student and teaches weekly computer classes at the church. His classes will move into a new community center that will be funded by part of this quarter’s Thirteenth Sabbath Offering. Thank you for your mission offerings that help people like Pheara reach out to their communities.